Earth Observation data processing and the development of Geographic Information Systems are our core competences since 1994. We design and develop solutions for management and sharing of territorial data applied to Land planning, management and monitoring. 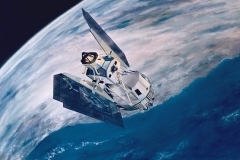 We operate mainly in the development and integration of Earth Observation data processing chains designed for the supply and distribution of user solutions derived from optical and radar data, as well as for the integration of these data in a fully operating SDI. We have also expertise in developing large-scale SDI for managing multi-source data and user segment elements. Our solutions are designed to respond to both national and regional level and to European Agencies and Institutions as the European Enviromental Agency (EEA), the European Union Satellite Centre (EU SatCen), European Defence Agency (EDA), the European Union (EC, REA, JRC), the European Space Agency (offering EO services, Geospatial data infrastructures, user segment, integrated applications) and the Italian Space Agency (for Earth Observation). Many are our experiences in European projects for GMES-Copernicus, EEA (European Enviromental Agency) and Public organizations at national, regional and local levels.